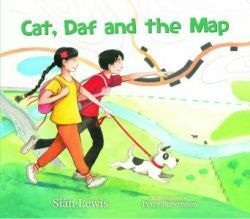 Cat, Daf and the map that comes to life. Catrin and Dafydd are staying with their aunt and uncle on Maesplwm farm. On their very first morning a lorry struggles up to the farm gate. It’s on its way to the town of Wernlas, but thanks to the Sat Nav it has taken a wrong turning. Uncle Harri directs the driver back to the main road, while Aunty Gwen produces an Ordnance Survey map. With the aid of the map, the children plan their own route to Wernlas, three miles away. Why don’t you come along? On each page of the book there’s a map which tells you which way to go and points out the sights of interest along the route. Join in the adventure and see how the illustrations bring the map to life.